Azaga Golf Club. Discover Lake Garda! 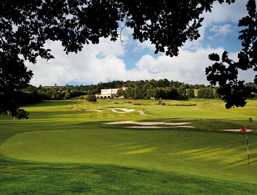 The Arzaga Golf Club is nestled in the hilly countryside of Calvagese in the province of Brescia and belongs to the Palazzo Arzaga Hotel SPA & Golf Resort. In this quiet and fascinating area, you can play golf all year round and enjoy the views of the surrounding countryside. The resort has two renowned golf courses. The Jack Nicklaus II 18-hole golf course in flat and hilly terrain. 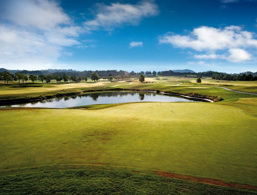 Bunkers and water hazards protect the 9-hole course by Gary Player. In the cosy clubhouse, there's an office, an elegant restaurant with panoramic views, a bar and a well-stocked Pro Shop with golf equipment and clothing. Arzaga Golf Club: 18 holes, par 72, designed by Jack Nicklaus II and the 9th hole.